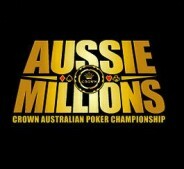 Since the beginning of the Aussie Millions there has never been an Australian player to win the main event. There have been some Australians that would come close to winning but they never were able to bring home the win. So at the start of the 2009 Aussie Millions Main Event it was the 2005 World Series of Poker Main Event Champion and fellow Australian who stood up and announced to everyone one “I think it’s about time an Aussie took home the title,” said Hachem. “Get your acts together!” Well at least one Australian took those words from Joe Hachem to heart and went to war with the rest of the world and that player was Stewart Scott. Going into final table play the only player at the table with really any credible tournament results was Barny Boatman who was the short stack at the start of the final table. The chip leader going into final table play was in fact the local Stewart Scott who had over $4.5 million in chips and the closest competitor to him was only at $2.5 million in chips. The final table was not a fast one at that and in fact it took some time to eliminate the first player which was the player with the most experience and that was Barny Boatman. After hours of play the final table was finally down to the last two remaining players which were Stewart Scott and Peter Rho. When heads up play began Steward Scott held almost a 4-1 chip lead over Peter Rho. On the last hand of the tournament, Stewart Scott looked down at the two best cards a player could ever get and those cards were pocket aces but the best part of the hand was when Peter Rho announced all-in with his A/J after Stewart Scott raised. At the end of the hand Stewart Scott’s arms were raised triumph. Below is a complete list of final table results. All money won is in Australian currency.